Hi, I am interested in your 1958 FIAT 600 (stock #CJNT054) listed on Autotrader for $22,900. I'd like to get more information about this vehicle and confirm its availability. 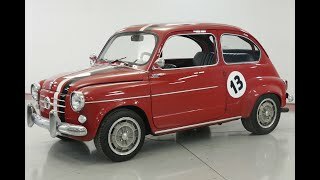 The Fiat 600 is a rear-engine, water-cooled city car, manufactured and marketed by Fiat from 1955 to 1969 offered in two-door sedan and four-door mini MPV body styles. Measuring only 3.22 m (10 ft 7 in) long, it was the first rear-engined Fiat and cost the equivalent of about 6,700 or US $7300 in todays money (590,000 lire then). The total number produced from 1955 to 1969 at the Mirafiori plant in Turin was 2,695,197. During the 1960s, 70s and 80s, many units were sold in countries such as Spain (as SEAT 600), where it became the icon of the Spanish miracle, Argentina, where it was nicknamed Fitito (a diminutive of FIAT) and former Yugoslavia where it was nicknamed Fi a (pronounced fee-cha).